Art Nouveau Palace Hotel is a centrally located unique property set in the historic ambiance of original Viennese Art Nouveau building from 1909, just a few steps from Wenceslas Square and Old Town Square, shopping areas and the State Opera. Soft lights in the warm and inviting elegant guestrooms create a cozy atmosphere where guests can forget the hustle and bustle of the city below. 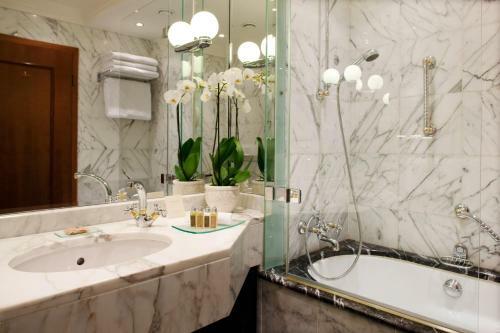 All of the 127 elegant rooms, some with amazing city views, offer free WiFi, tea & coffee making facilities, mini-bar, Italian Carrara marble bathrooms, bathrobes & slippers. 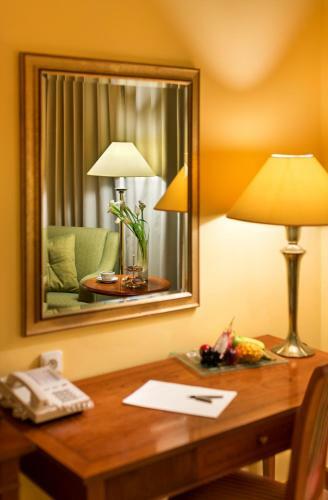 Jalta Boutique Hotel price per day from €74 Situated directly on Wenceslas Square in central Prague, the elegant and luxurious boutique hotel Jalta is right next to the State Opera and the National Museum. The Jalta Hotel's air-conditioned rooms overlook the square and museum or the peaceful inner courtyard. The Como Restaurant & Café serves Mediterranean and traditional Czech cuisine, as well as a large and varied breakfast buffet. 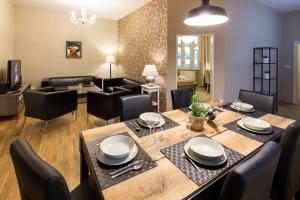 It features a terrace overlooking Wenceslas Square and a balcony for romantic dinners. Falkensteiner Hotel Maria Prag price per day from €79 Falkensteiner Hotel Maria Prag offers free spa facilities and a generous buffet breakfast. 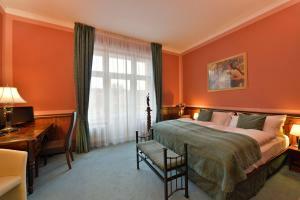 Wenceslas Square, the National Museum and Charles Bridge are all less than 10 minutes’ walk away. 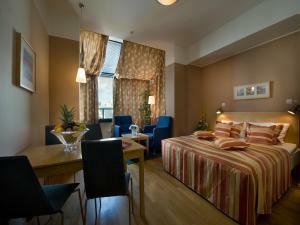 Free Wi-Fi, air conditioning and satellite TV are standard room facilities. Each room includes functional wooden furniture, white walls and large soundproofed windows. Free spa facilities include a sauna, steam bath and fitness studio. 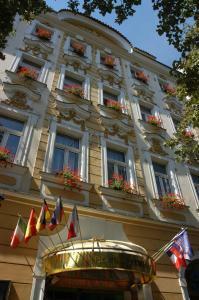 Yasmin Hotel price per day from €92 Yasmin Hotel is situated in the heart of Prague, just around the corner from Wenceslas Square. The stylish and modern rooms are all equipped with air conditioning and luxurious bathrooms. Guests can benefit from free access to wired internet in all rooms. The Yasmin’s restaurant and café serves delicious international and national cuisine. 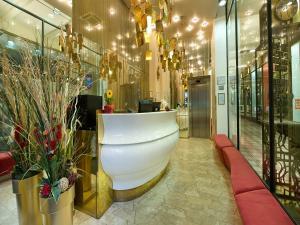 Yasmin Hotel offers a 24-hour front desk, a sauna and a fitness centre. 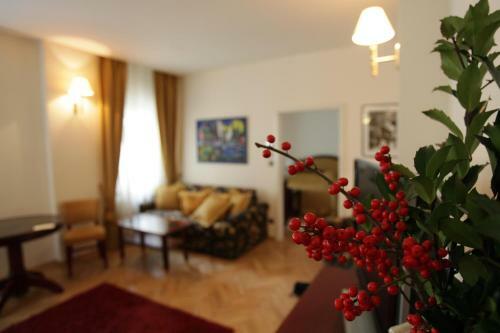 Hotel Liberty price per day from €56 Hotel Liberty is situated right on famous Wenceslas Square, and offers charming, fully equipped rooms and suites with wireless internet access free of charge. The gym is accessible free of charge for hotel guests. The metro station Můstek is situated just around the corner. Charles Bridge can be reached within a 10-minute walk. Transport and other services are available upon request at the reception. 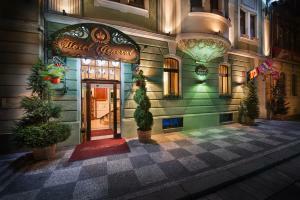 Restaurant The Alcron, Prague Guest reviews: 9,4/10 ~ 0,4 km from Art Nouveau Palace Hotel Address: Stepanska 40, 110 00, Prague. 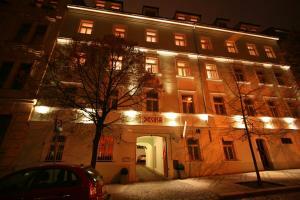 Restaurant Indian Jewel, Prague Guest reviews: 7,2/10 ~ 0,5 km from Art Nouveau Palace Hotel Address: Tyn 6, 11000, Prague. Cuisine: Indian. Restaurant Zdenek's Oyster Bar, Prague Guest reviews: 9,2/10 ~ 0,5 km from Art Nouveau Palace Hotel Address: Mala Stupartska 5, Prague. Cuisine: Seafood. Restaurant Casserol, Prague Guest reviews: 9,2/10 ~ 0,7 km from Art Nouveau Palace Hotel Address: Karlova 147/44, Prague 1, 11000, Prague. Cuisine: Czech, Contemporary. 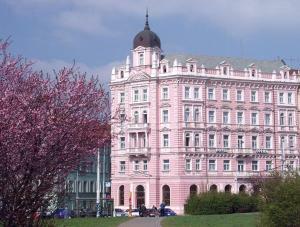 Restaurant Nase Maso, Prague Guest reviews: 9,4/10 ~ 0,8 km from Art Nouveau Palace Hotel Address: Dlouha 39, Prague.